Unions, Parties and the decision to strike. For the bulk of my academic career I worked on issues of regime change and interest group intermediation, with a particular interest in Latin America. I wrote a couple of books (one co-authored) about state-labour relations in several South American countries and a fair number of articles that included discussion of how labour engaged in collective action under different regime types. The comparative study of state-labour relations remains an abiding interest of mine. One of the axioms of comparative democratic labour relations is that unions will engage in more cooperative labour relations strategies and therefore strike less under Left governments than they will under Right governments. The presumption is that since Left governments are working class based or supported, and because they are sympathetic to working class concerns in their policy platforms, there is less incentive for unions to take strong collective action against them, particularly with respect to strikes and other forms of labour service withdrawal. This is especially so because such direct action could undermine the Left government in question and leave it vulnerable at the next election. Because unions presumably prefer to have Left governments over Right governments in office, resorting to labour service withdrawals would be a counterproductive union political strategy over the medium term even if economically productive over the short term. That is true of public sector strikes in particular (since strikes, even when focused on economic issues, are inherently political when they involve the state as employer), but private sector strikes are also seen as electorally injurious to Left governments (after all, if a Left government cannot “control” unions then what is the point of having them?). In terms of so-called political strikes as well as economic strikes, Labour governments are generally thought to offer a better prospect for labour peace. Conversely, unions supposedly dislike Right governments and therefore engage in more confrontational approaches to labour relations, particularly if there perceive that there has been a rollback of union legal and economic gains under those or previous Right governments. Both economically and politically, unions have reason to adopt more militant strategies under Right governments. The subtleties embedded in this dichotomy are found in the strategies of public sector versus private sector unions against a backdrop of relative union density and the legal frameworks governing wage-setting. This assumes that union leaders and members share the same ideological orientation and that union leaders accurately transmit the material demands of the rank and file during negotiations with the State and employers (i.e. the principal/agent relationship is tight and coordinated). At that point employer characteristics at the level of the firm as well as productive sector come into play, set against a backdrop of relative business sectorial organisation (both as producers and employers) and the labour relations framework operative at the time. A collective action and strategic interaction is framed by macroeconomic conditions and government budgets, with sectorial growth and Treasury surpluses being determinants of the latitude for negotiation in any particular instance. For the last three decades all of this occurs in the context of the globalisation of production, consumption and exchange under market-oriented macroeconomic policies developed and implemented by public sector technocrats that seek to outsource public sector service provision and downsize the legal authority and managerial and regulatory functions of the State as part of government mandated, market-oriented ideological agendas. In the era of market-oriented economic reform, changes in labour relations’ legal frameworks have tended to favour employers and business associations over labour unions under both Left and Right democratic governments, with the degree of favouritism seen in the approaches towards collective bargaining adopted by each. Overall, although Left governments have mitigated much market-oriented labour reform while Right governments have sought to accentuate and exploit them in order to weaken the labour movement and atomise working class representation and collective strength, the trend has seen a weakening of union power across the democratic capitalist world as measured in union density, membership numbers and the collective rights and legal authority governing working class representation in production. This has been acutely felt in the private sector where individual worker rights and contracts predominate over collective rights and representation. With their relative collective strength, public sector unions remain as the diminished core of most contemporary labour movements in capitalist democracies. A key factor in determining the propensity to strike is wage-setting institutions. Generally speaking, the more centralised the bargaining nexus and more monopolistic the bargaining agents doing the negotiating, the more likely that unions will prosper in their demands without having to resort to strikes. In contrast, the more decentralised the bargaining forum and the more disparate the bargaining agents, the more likely it is that employers will have the upper hand in bilateral negotiations with employees, thereby increasing the possibility of strikes. For example, tripartite (labour, state, capital) wage boards governing wage negotiations in specific economic sectors tend to push compromises that trade incremental wage gains for productivity, job security and reinvestment guarantees. Conversely, enterprise level bargaining between employers and various employee bargaining agents tends to fix or depress wage bills in exchange for non-wage guarantees. In New Zealand collective bargaining is more closely based on the latter model rather than the former and yet overall strike levels have remained low. The way in which the union movement is incorporated and inserted in the political system matters in this regard. The form of initial incorporation (that is, the way in which unions are initially integrated into the national political system), may be more of historical rather than practical import for well-established unions created in the previous century and whose insertion in the political system today was consolidated some time ago. But initial incorporation matters much to recently organised contemporary unions without long political histories. That is because the terms of their political incorporation and subsequent political insertion in the political system are still being determined and sometimes disputed, including by older or more established unions as well as the State and employers. These may not echo or even resemble the conflicts surrounding initial labour incorporation and political insertion in the past, but they nevertheless condition the way these newer collective agents are allowed to exercise economic and political representation in the present context. There are three main forms of labour political insertion. In some liberal democracies organised labour is inserted in the political system in Left party dominant fashion, e.g., the party dominates the union in both leadership selection as well as member political affiliation. In other liberal democracies unions dominate or control the party, with union representatives holding key Party positions down to grassroots organising and regularly running for office. In still others unions are independent of Left political parties although nominally sympathetic to them, with union leaders and members displaying a broader range of party affiliations than under the first two types. In illiberal democracies so-called “yellow” unions (factory or business unions and “professional associations”) exist that are independent or affiliate with Right parties. In the main these are not considered to be authentic representatives of working class collective interests because they are created by or at the behest of employers in lieu of them. This brings up the subject at hand. There currently is the possibility of nurses, public servants and teacher’s strikes in the next few weeks. Conservative commentators have claimed that this is to take advantage of the Labour-led coalition’s “weakness” and to seize the moment of opportunity provided by Labour’s unwillingness to confront the unions in question. That runs against the conventional wisdom about Left governments and unions. So the question is: why are the nurses, public sector and post-primary teacher’s unions threatening to strike? One answer may lie in that all of these collective agents are public sector unions that are independent of the Labour Party and its coalition partners. Membership density is high but the sociological demographic in each is changing, with younger members being more ethnically diverse and less identified with the traditional class structures of the industrial era (since those under 30 are of the post-industrial, post-modern age). This may have led to a rejigging of agent/principal relations within the respective unions that might make them more prone to challenge the labour relations orthodoxies of the past, to include being more cooperative when Left governments are in power. Another answer may lie in the fact that Labour, for all of its “progressive” policy pronouncements and initiatives, still clings to market-driven logics of production that, even when cushioned along the margins, reinforce the collective bargaining dominance of capitalists. Seen in labour legislation and the role of national labour administration as an interlocutor between labour and capital, this includes cost-cutting managerial rationales in the public sector, where modern Taylorist principles have been borrowed from the private sector and applied to public sector service provision. That bureaucratic orientation could be partially due to the fact that most Labour leaders are career politicians with few backgrounds “grounded” in the realities of working class activism, and/or because the party’s focus has recently concentrated more on identity rather than class politics. This has caused Labour to accept market logics in principle and market-oriented solutions to employment relations in fact. The NZ Labour Party is less a working class party than a coalition of post-industrial causes joined by antipathy to conservative (read: Anglo-Saxon Christian capitalist heterosexual and patriarchal) mores. Seeing the situation in this light could well disincline nurses, teachers and bureaucrats from continuing to toe the “cooperative” line, especially if the union demographic traits outlined above prove to be correct. It is worth noting that the long-established unions affiliated with the Labour Party have not uttered a peep about strikes, to include not offering solidarity with the nurses and teachers. Newly created unions like UNITE in the private sector have engaged in strikes regularly against private employers under the previous Right government and are supportive of the action. But in general the union movement in New Zealand has remained out of the conflict between the State (as manager and employer via the civil service, DHBs and Education Ministry) and the nurses, bureaucrats and teachers unions. Another question is why did these unions (or most others, for that matter) not strike regularly when the National government was in office? Was it a matter of contracts being in force? Or was it the limits placed on strike action both legally and practically? On the face of it, it seems odd that civil servants, nurses, teachers and other productive groups would wait to strike until Labour was in office if they were out of contract towards the end of the National government. Did they think that striking in an election year would lessen Labour’s chances of winning a plurality and forming a government or, put more appropriately, strengthen National’s arguments that they needed to continue to hold a tight reign on labour market dynamics less the economy lose momentum? This is true for private sector unions but particularly so in the case of public sector unions. Or are the conservative commentators correct and non-Left party affiliated public sector unions simply more willing to exploit Labour’s perceived “weakness” on collective bargaining matters? If so, then the Labour-led coalition has a problem that is more political than economic. I am still working through the logics at play because I do not know the internal dynamics of the unions in question nor the Labour-led government’s strategy for handling the strike threat. But if any readers would like to join the discussion and illuminate me on the details of each position, that would be welcome. New Zealand goes it alone. The New Zealand Labour government’s refusal to join international collective action against Russia over the nerve agent attack in the UK on former spy Sergei Skripal is perplexing. The 27-nation solidarity coalition expelling Russian diplomats and intelligence officers from their soil includes all of New Zealand’s major security partners as well as important trade counterparts. New Zealand is a member of the 5 Eyes signals intelligence collection and sharing network including Australia, Canada, the UK and the US, so it has better knowledge than most as to what evidence the UK has to indicate that Vladimir Putin’s regime ordered the hit on Skripal. New Zealand is an extra-regional NATO and EU associate, and like the majority of the members of the coalition, it is a democracy. New Zealand fashions itself as a good international citizen and honest broker in international affairs, so it seems odd that it would not join its closest diplomatic interlocutors in what is largely a symbolic gesture of repudiation of Russian misbehavior abroad. The decision was made all the more quixotic by Prime Minister Jacinda Ardern’s claim that there are “no undeclared Russian intelligence operatives” in New Zealand and hence there was no need to expel anyone. 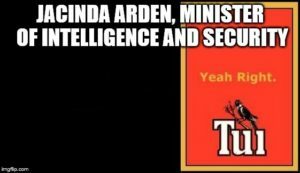 She claimed to have assurances from the Ministry of Foreign Affairs and Trade (MFAT) that was the case, even though MFAT has no counter-intelligence function nor the ability to ascertain who is and who is not a Russian intelligence officer, declared or undeclared (that is the job of the Security Intelligence Service (SIS)). She later changed her story to saying that her advice did in fact come from the SIS, but without acknowledging her original misstatement (which happened during a RNZ interview so is recorded for posterity). Her repeated comments that if there were such spies in New Zealand they would be expelled produced derisive headlines around the globe but more importantly, raised questions about her competence when handling security matters. Discussion in New Zealand about the issue has been muddled by the PM’s remarks. The minor aspect of the story is about whether there are Russian intelligence operatives in NZ and whether they should be expelled. The answers to that are “yes” and “possibly.” “Possibly” depends on the answer to the major aspect of the story: the reasons why NZ decided not to join the so-called “expulsion coalition.” I shall focus on the latter but suffice it to say that all of the 150 Russian personnel expelled by the coalition hold diplomatic passports so by definition are not working undercover as spies without diplomatic immunity. Nor were all of those expelled intelligence officers working under official cover (i.e. with diplomatic immunity). The detour into what constitutes an “undeclared intelligence agent” was unnecessary and unhelpful in clarifying the reasons behind NZ’s decision to reject the UK request to join it in repudiating the Russian assassination attempt. That reasoning continues to remain unclear at present. Claiming that the decision to not adhere to the collective expulsion action is because there was no one who met the definition of “undeclared intelligence agents” operating in New Zealand is a diversion from the underlying rationale because it puts the focus on the instrumentalities of response rather than the reasons for it. So why has New Zealand chosen to isolate, or perhaps better said, alienate itself from its traditional allies and major security partners? To be sure, members of the coalition have their own histories of foreign skullduggery and intrigue, to include extrajudicial killings abroad. Moreover, diplomacy is often no more than hypocrisy masquerading as self-righteousness standing in defense of principle. Perhaps the Labour government wants to give the lie to the posturing of its most important allies. Even so, pragmatic assessments usually inform foreign policy decisions, particularly those involving choosing sides in international disputes. That is particularly true for small states when confronted with the demands of quarreling powers to take a position in favour of one side or the other. This “Melian Dilemma” is an unavoidable part of being small in a world dominated by competing great powers, so Lilliputians such as New Zealand usually think long and hard before taking an unpopular stand—particularly amongst its friends. New Zealand’s decision not to participate in the solidarity coalition was made in the face of a direct request from the May government and in spite of the fact that the collective action is largely symbolic. Although Russian intelligence operations will be adversely affected in places like the UK, US and Germany, many of those being expelled are “normal” diplomats who can be recalled at some future date. So the downside to joining the coalition would seem relatively small even with Russian threats of retaliation, and the upside in terms of being seen to be a good diplomatic partner that supports international norms could well outweigh whatever the Russians can respond with. Perhaps there lies the explanation. New Zealand’s foreign policy in recent years has been trade obsessed and speculation has it that members of the foreign policy establishment see the possibility of advancing a bilateral free trade agreement (FTA) with Russia in the vacuum left by the trade sanctions levied on it in the wake of the Ukrainian invasion and annexation of Crimea. New Zealand and Russia opened talks on trade before the sanctions were imposed, then suspended them afterwards. Official advice from the foreign ministry is that violating the sanctions regime to try to exploit a possible window of opportunity vis a vis Russia is counterproductive at best. But talk in Wellington is that some in the Labour-led government are keen to resume negotiations, so taking a contrary stance on response to the nerve agent assassination attempt is a means of currying favour with Putin at a time when other competitors are not. Given that Foreign Minister Winston Peters has questioned claims that Russia was involved in the shoot-down of the Malaysian airliner over the Ukraine, or that it interfered in US and European elections, and has refused to name Russia as the perpetrator of the attempted Skripal hit, what once seemed to be an unhinged rationale for resuming bilateral trade negotiations is now being given credence. It is also possible that Labour is attempting to stake out its “independent and autonomous” foreign policy credentials after nine years of the previous government’s rapprochement with the US and the other Five Eyes partners. Given the animosity felt towards Donald Trump (and to a lesser extent Teresa May) amongst Labour supporters as well as those of its coalition partners (New Zealand First and the Green Party), this is a way of playing David versus Goliath(s) for domestic audiences. New Zealand could also be signalling the international community. After all, over 140 nations did not sign up to the collective action, including major trading partners in Asia and the Middle East. No Pacific Island nation (other than those represented by France, the UK and US) signed on to the deal. So in terms of demonstrating its sovereign resolve to remain out of great power conflicts when and where possible, this Labour government may be channeling the spirit of independence championed by David Lange during the 1985 nuclear showdown. And yet, pragmatic assessment of the situation would advise the Labour-led government to address the short and long term costs and benefits of alienating its most important foreign partners by refusing to join in the symbolic repudiation of Russia. By any objective measure, to include the possibility of securing bilateral trade with Putin’s regime, the costs of doing so will clearly outweigh the benefits even if it does not interfere with the daily business of intelligence sharing and military cooperation with the Five Eyes and other security partners. On the other hand, virtue signalling its independence may garner New Zealand some favor with those outside of the “exclusion coalition” as well as domestic audiences. The play is both short and long-term in nature, with the question being will a short term move of this sort translate into longer term benefits or losses. In the diplomatic world the shadow of the future hangs heavily over present decision-making. Sequels are uncertain and memories are elephantine in nature. The consequences of being shortsightedly contrarian are determined not by the contrarian but by those refused support on a matter of international consequence and foreign policy alignment. On the other hand, standing up to great power partners may risk the wrath of those slighted but win broader appeal among those in the global community who are averse to the machinations of the mighty. With that in mind the question remains: what exactly were the reasons for this move and what does the New Zealand Labour government expect to gain from its contrarian (even if principled) stance? A shorter version of this post appears in The Guardian on line, March 28, 2018. Plus ca change, or, does Labour have a foreign policy? Among the things mentioned during the 2017 election campaign, foreign policy was not one of them. This is not surprising, as domestic policy issues tend to dominate election year politics in times of peace in virtually all democracies. The syndrome is compounded in New Zealand, where matters of diplomacy, international security and trade are notable for their absence in both parliamentary debates as well as public concern, only surfacing during moments of controversy surrounding specific issues such as foreign troop deployments, NZ involvement in Anglophone spy networks or negotiating trade deals that appear lopsided in favour of other states and economic interests. Even if foreign policy is not a central election issue, it nevertheless is an important area of governance that should in principle reflect a Party’s philosophy with regard to its thrust and substance. Given that the Labour-led coalition that formed a government in 2017 represents a departure from nine years of center-right rule, it is worth pondering what approach it has, if any, to reshaping foreign policy in the wake of its election. It should be noted that NZ foreign policy has been relatively consistent over the last 20 years regardless of which party coalition was in government. Dating to the break up of the ANZUS defense alliance on the heels of its non-nuclear declaration in 1985, NZ has championed an “independent and autonomous” foreign policy line that, if not completely integrating it into the non-aligned movement that rose during the Cold War, granted it some latitude in how it approached its diplomatic relations and international commitments. Foremost amongst these was support for multilateral approaches to international conflict resolution, concern with ethics, rules and norms governing international behaviour, advocacy of small state interests and a self-assigned reputation as an “honest broker” in international affairs. Issues of trade, diplomacy and security were uncoupled once the Cold War ended, something that allowed NZ to navigate the diplomatic seas without the constraints imposed by binding alliance ties to larger partners. From the mid-90s there has been a trade-centric core to NZ foreign policy, to the point that promoting “free” trade and negotiating trade deals, be they bi- or multilateral in nature, is seen to have overshadowed traditional diplomatic and security concerns such as nuclear non-proliferation, environmental protection and human rights promotion. This “trade-for-trade’s sake” approach was initiated by the Shipley government but deepened under both the 5th Labour government as well as the National-led governments headed by John Key. After 9/11 it was paralleled by a reinforcement of security ties with traditional allies such as Australia, the US and the UK, in spite of the fact that the move towards expanding trade relationships in Asia and the Middle East ran against New Zealand’s traditional advocacy of a principled foreign policy that defended human rights as well as the thrust of the geopolitics perspectives of security allies (which view NZ trade partners such as China and Iran as adversaries rather than partners). Although both Labour and National continued to voice the “independent and autonomous” foreign policy line during the 2000s, what actually took place was the development of two separate tracks where NZ pushed trade relations without regard to security commitments and human rights, on the one hand, and on the other hand deepened its involvement in US-led security networks without regard to broader diplomatic concerns. This was formalised with the signing of the bi-lateral Wellington and Washington Declarations in 2010 and 2012. For NZ diplomats, the parallel track approach was a matter of keeping eggs in different baskets even if it violated the long-standing principle of security partners trading preferentially with each other. That is not a problem so long as NZ trading partners are not seen as hostile to or competitors of the US and its main allies. Yet NZ chose to expand its trade ties with China with the signing of a bilateral Free Trade Agreement (FTA) in 2008, something that has not only increased its trade dependency on China in the years that followed (China is now NZ’s second largest export market and third largest import market), but also put it in the unenviable position of trying to remain balanced in the face of increased US-China competition in the Western Pacific Rim. Similarly, NZ-Iranian trade ties, and the nascent talks about NZ-Russian bilateral trade, both run the risk of negatively counterpoising NZ’s economic and security interests in each case. Following Labour’s lead, the National government doubled its efforts to reinforce its ties to the US-led security network while pushing for trade agreements regardless of domestic opposition to both. It committed troops to the battle against Daesh in Iraq and Syria and continued to maintain presence in Afghanistan after its formal commitment to the ISAF mission ended in 2013. It revamped and upgraded its commitment to the 5 Eyes signals intelligence collection partnership that includes the US, UK Australia and Canada. It loudly advocated for the TransPacific Partnership Agreement (TPPA) even though the 12 country pact was largely seen as favouring US economic interests and serving as the economic component of a US containment strategy towards China in the Western Pacific. Now it is the Labour-led coalition headed by Jacinda Ardern that holds the reins. What can we expect from it when it comes to foreign policy? Continuity when it comes to the “two-track” approach? A deepening of one track and softening of the other? An attempt to bring a third track–what might be called a humanitarian line that re-emphasises human rights, environmental protection and non-proliferation, among other rules-based policy areas–into the mix? From what is seen in its foreign policy manifesto, Labour appears to want to have things a bit of both ways: overall continuity and commitment to an “independent” foreign policy but one in which ethical concerns are layered into trade policy and in which international security engagement is framed by UN mandates and multilateral resolutions (as well as a turn away from military combat roles and a re-emphasis on peace-keeping operations). A commitment to renewed diplomatic endeavour, particularly in international fora and within the South Pacific region, is also pledged, but the overall thrust of its foreign policy objectives remain generalised and rhetorical rather than dialed in on specifics. A few months into its tenure, the new government has done nothing significant with regards to foreign policy. Jacinda Arden made some noises about resettling the the Manus detainees in NZ during her first official trip abroad, only to be rebuked by Australian PM Malcolm Turnbull and her own Opposition. She also made ill-advised comments about who Donald Trump may or may not thought she was, leading to skepticism as to the veracity of her story. NZ First leader Winston Peters was named foreign minister more as a matter of style (and reward) rather than in recognition of his substance when it comes to foreign affairs. Likewise, Ron Mark got the nod to be Defense Minister in what appears to be a sop thrown to an old soldier who enjoys military ceremonies but cannot get his medals rack sorted correctly. Andrew Little was apparently made Minister responsible for Intelligence and Security because he is a lawyer and a reputed tough guy who as Opposition Leader once sat on the Parliamentary Select Committee on Intelligence and Security, rather than because he has any particular experience in that field, especially with regard to its international aspects. The Greens, in the past so vociferous in their defense of human rights, pacifism, non-interventionism and anti-imperialism, have gone silent. As for the Labour Party foreign policy experts, whoever and how many there may be (if any), the question is how do they see the world. Do they use (neo) realist, idealist, constructivist or some hybrid framework with which to frame their perspective and that of their government? Do they use international systems theory to address issue linkage in foreign policy and to join the dots amongst broader economic, social, military and political trends in world affairs as well the nature of the global community itself? Are they aware of the Melian Dilemma (in which small states are often forced to choose alliance between competing Great Powers)? iven the predominance of trade in NZ foreign policy, how do they balance notions of comparative and competitive advantage when envisioning NZ’s preferred negotiating stance? If not those mentioned, what conceptual and theoretical apparatuses do they employ? On a practical level, how do their views match up with those of the foreign affairs bureaucracy and career diplomatic corps, and what is their relationship with the latter? Issues such as the ongoing NZDF deployments in Iraq (and likely Syria, if the NZSAS are involved) have not (yet) been reviewed in spite of early campaign promises to do so. Nor, for that matter, has Labour taken a detailed critical eye to the stalled TPPA negotiations now that the US has abandoned them, or re-examined its diplomatic approaches towards the Syrian, Ukrainian and Yemeni civil wars, South China Sea conflicts, the North Korean nuclear weapons program, post-Brexit economic relations, maritime conservation regimes and a host of other important and oft-contentious topics. Judging from the manifesto it is hard to discern a coherent intellectual underpinning to how Labour policy makers approach international relations. It is also difficult to know how the new government’s foreign policy elite relate to the careerists charged with maintaining NZ’s international relations. So far, there is no identifiably Labour approach to foreign affairs and policy carry-over from previous governments is the norm. That may not hold for long. The election of Donald Trump to the US presidency has changed the global environment in which NZ foreign policy is formulated and practiced because if anything, he has rejected some of the foundational principles of the NZ approach (support for the UN and multilateralism) with his “America First” philosophy and has increased global tensions with his belligerent posturing vis a vis adversaries and his bullying of allies. That combination of provocation, brinkmanship and alienation of allies brings with it high risks but also a diplomatic conundrum for NZ. Given that NZ maintains good relations with some of US adversaries as well as allies, yet is intimately tied to the US in uniquely significant ways, its ability to maintain the dichotomous approach to an independent foreign policy may now be in jeopardy. After all, the US now demands open expressions of “loyalty” from its allies, for example, in the form of demands that security partners spend a minimum of two percent of GDP on defense (NZ spends 1.1 percent), and that trade partners give acknowledged preference to US economic interests when signing “deals” with it. In that light, and with Trump increasingly looking like he wants open conflict with one or more perceived rivals (and is on a clear collision course with China with regards to strategic preeminence in the Western Pacific), the “two-track” NZ foreign policy may now be more akin to trying to straddle a barbed wire fence while balancing on ice blocks rather than a matter of saving diplomatic eggs. In light of this, it is time for the Labour government to stand up and be heard about where they propose to steer NZ in the international arena during what are clearly very fluid and uncertain times.